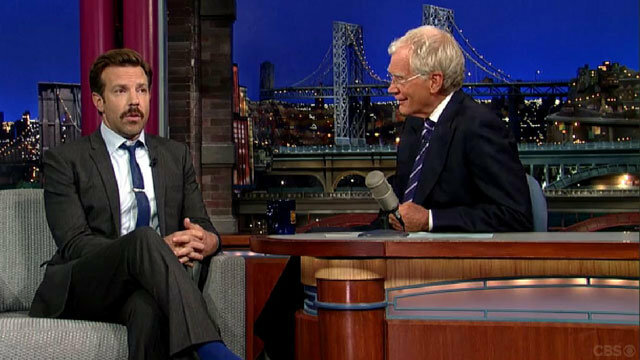 Add Jason Sudeikis to the growing list of "Saturday Night Live" stars jumping ship. Sporting bright blue socks and a "Magnum, P.I. "-esque mustache, the ten-year "SNL" veteran (two as a writer, eight as a performer) told Letterman, "I'm definitely done. I'm gonna leave. I won't be back in the fall." Sounds pretty definitive to us. When Letterman asked, "Do they know that?" Sudeikis feigned uncertainty: "I don't know what kind of ratings you're getting these days, but I hope someone would tell them." Cut to Lorne Michaels brooding in his massive throne overlooking Rockefeller Center. All jokes aside, Lorne does have reason to brood. Sudeikis joins "SNL" MVPs Bill Hader and Fred Armisen on the way out, leaving the NBC sketch-comedy institution with a thin bench of mostly unknowns heading into its 39th season. But of course, plenty of media reports have predicted "SNL's" demise in years past and have been dead wrong, so we won't write the show's obituary just yet. The magnitude of the move hasn't really hit Sudeikis yet, but he told Letterman it probably will soon, when "SNL" starts back up again: "You start to get that itch in August, where all these sketch ideas will show up, and I'll be like, 'Well, can I make this sketch idea last 90 minutes and turn it into a movie?'" Sudeikis is already making waves on the big screen: He's co-starring with Jennifer Aniston in the upcoming comedy "We're the Millers" (out August 7) and starting work on a "Horrible Bosses" sequel, due out next year.